Keith Briggs joined up with his former manager, Steve Burr, at Aggborough in May 2010 after leaving Stalybridge Celtic where he had been for two seasons. The defender was happy to play anywhere in defence as long as it was on the right hand side of the pitch. He started his career with Stockport County before being transferred to Norwich City for a fee of £65,000 but he failed to make any kind of impression at Carrow Road and left after just five games for them before moving back to Stockport. He left them for Shrewsbury Town in January 2008 and again failed to impress his new club and left after a few weeks and two games before turning up at Mansfield Town. He also left there soon after when he became homesick for Manchester and re-signed for Stalybridge. Surprisingly just one year into a two year contract with us he left and signed up with play off contenders Fleetwood Town for a fee reported to be around £5,000. 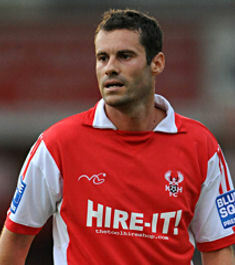 Keith then returned to the Harriers for another season, after being released by then promoted Fleetwood, in July 2012. Since retiring from the playing side he has managed Stalybridge and New Mills AFC near his hometown of Glossop in Derbyshire.